If you are going to be in Disneyland this fall, between the dates of September 25th and October 31st, you’ll want to consider purchasing tickets to Mickey’s Trick Or Treat Party. 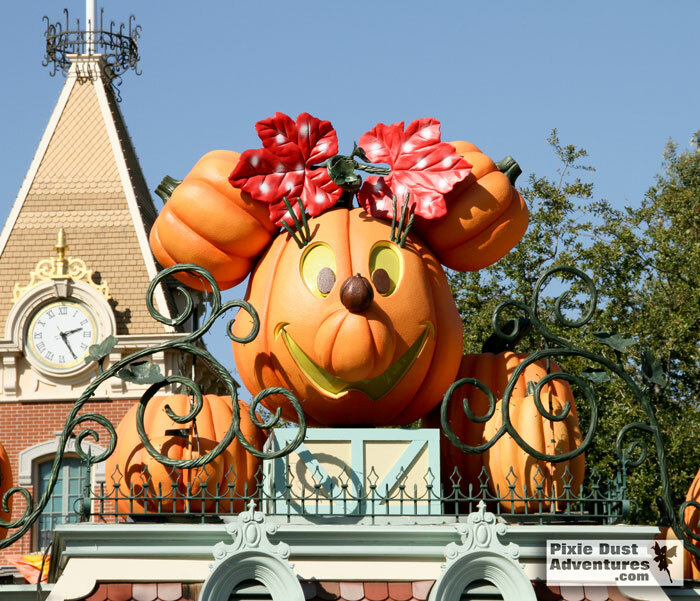 This, larger than life, Minnie Mouse Pumpkin looks down on visitors as they enter Disneyland Park at Halloween time. This one-of-a-kind Halloween event is not to be missed. On select dates, with your ticket to the Halloween party, you will be able to enter the park at 4:00pm and the park closes to the general public between 6:00pm and 7:00pm to begin the party. Start times depend on the night and the end time is between 11:00pm and midnight, also depending on the night. Mickey’s Trick-Or-Treat party is in addition to popular Halloween Time seasonal attractions such as, Haunted Mansion Holiday and Space Mountain Ghost Galaxy, famous Disney Villains, Mickey Mouse and his friends in Halloween costumes and the Dia de los Muertos celebration . During the party you can enjoy special character meets and delectable treats that you won’t see during normal operating hours. 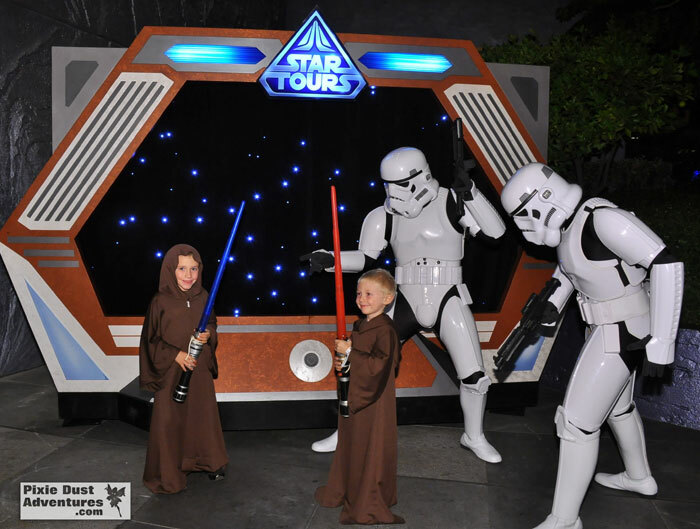 One long lasting memory for my boys was meeting the storm troopers outside of the Star Tours Attraction. One of my childrens’ favorite parts of the party is the trick-or-treat candy stations. Each station is clearly marked on a special map and will have a glowing ghost or pumpkin so they are easily seen. You can get in each line an unlimited number of times & they give out some awesome candy. Not the cheap stuff here. 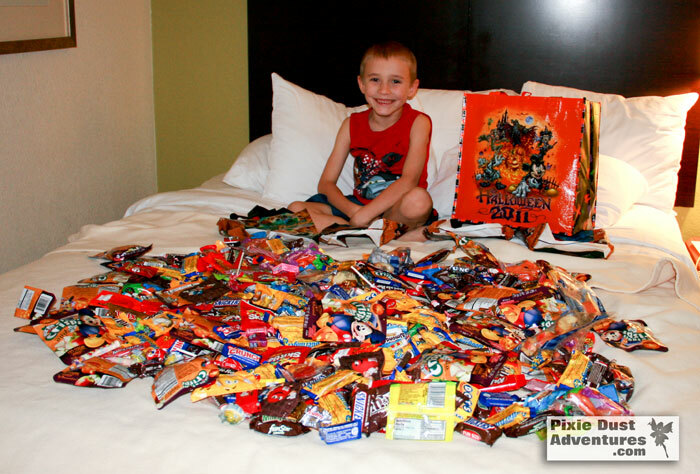 19 pounds of amazing Halloween Candy is what we scored at Mickey’s Trick or Treat Party! You can see above my son with their loot that consisted of 19 pounds of delicious, mouth watering, cavity causing, Halloween candy. A dentist nightmare I know, but the kids love it! Select attractions are open and This year, Mickey’s Halloween Party will include “Paint the Night” parade, celebrating Disneyland’s 60th anniversary, and “Halloween Screams” fireworks. Mickey’s Costume Party cavalcade parade will not be featured. Click here and visit my website today. Fill out the quote form for a free, no obligation quote.